How to Save Income Tax for FY 2017-18? We are releasing the eBook on Tax Planning which tells you how to save income tax for FY 2017-18 (AY 2018-19). This is a short 43 slide power point presentation (in pdf) which covers all the tax saving sections and investments applicable for salaried or business tax payers. But before that lets look at the changes that happened in Income Tax laws in Budget 2017. 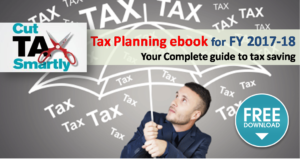 The new version of Income Tax Planning ebook for FY 2018-19 is now available for Download on this link. Budget 2016 had provided additional exemption up to Rs 50,000 for payment of home loan interest for first time home buyers. To avail this benefit the value of home should not exceed Rs 50 lakhs and loan should not be more than Rs 35 lakhs. Premium paid for Mediclaim/ Health Insurance for Self, Spouse, Children and Parents qualify for deduction u/s 80D. You can claim maximum deduction of Rs 25,000 in case you are below 60 years of age and Rs 30,000 above 60 years of age. An additional deduction of Rs 25,000 can be claimed for buying health insurance for your parents (Rs 30,000 in case of either parents being senior citizens). This deduction can be claimed irrespective of parents being dependent on you or not. However this benefit is not available for buying health insurance for in-laws. Cost incurred for treatment of certain disease for self and dependents gets deduction for Income tax. For very senior citizens (more than 80 years of age) the deduction amount is up to Rs 80,000; while for senior citizens (between 60 to 80 years of age) it Rs 60,000 and for all others its Rs 40,000. Dependent can be parents, spouse, children or siblings. They should be wholly dependent on you. here you go How to Save Long Term Capital Gains Tax from Property?